LET'S GET ACTIVE PROJECT HAS ENDED 31-12-2015. THANK YOU ALL FOR INVOLVEMENT! The summary of the project, describing the activities realised, you will find HERE. 1) Enable the steps that would strengthen the link between social intelligence and civic participation. 2) Focus on creating centers for training civic leaders and thus addressing the need of people to be more informed about civic engagement. 3) Making the process of the decision on public matters taking more transparent, by disclosing the positions and funding sources of lobbyists. 4) Promoting independent thinking and limiting media propaganda by promoting the idea of having live coverage (TV, Web) of parliamentary discussions. 5) Strengthen and support independent media. 6) Strengthen the importance of Non-governmental Organizations and thus making them an internal part of the governing process. Protecting and promoting freedom of speech. 3. The International Citizens Forum Report. The Recommendations will be also sent to national level bodies/institutions/organisations in four countries of the project partnership as well as disseminated among w wide public. THE INTERNATIONAL OPEN ON-LINE RESEARCH REPORT PUBLISHED! We have the pleasure to announce, that the English version of the Open On-line Research Report concerning active democratic participation is now published. The national language versions of the report (Polish, Romanian, Italian and Greek) will be available in December. The goal of the open on-line research was to create a space where the European Union’s citizens could share their opinions, needs, expectations and ideas concerning active participation in the democratic life of EU, in order to: learn the reasons and root causes of not participating in the democratic life of the EU; to learn what the possible incentives, that could increase the citizens to participation in the EUs’ policies shaping, could be. There were 701 persons, who took part in the research answering at least the mandatory questions. The research was initially designed to take place in Poland, Romania, Italy and Cyprus, still, thanks to the English version, in total, respondents representing 40 various countries took part in it. Participants came from both inside and outside Europe: Poland (175 questionnaires collected), Romania (224 questionnaires collected), Italy (169 questionnaires collected), Cyprus (26 questionnaires collected) and: Portugal, Hungary, Scotland, Lithuania, Morocco, France, Slovakia, Spain, Bulgaria, Croatia, Albania, Greece, Austria, Germany, UK, Kazakhstan, Kosovo, FYR Macedonia, Bosnia And Herzegovina, Turkey, Ukraine, Switzerland, Pakistan, Ecuador, Lebanon, Argentina, Armenia, Lithuania, Moldova, Azerbaijan, Armenia, Tunisia, Montenegro, Latvia, Slovenia, Serbia and Belgium. The open on-line survey lasted 3 months, from April 2015 till June 2015. The research was being realized in 5 language versions: English, Italian, Rumanian, Polish and Greek. The survey engaged 4 specific topics and the questionnaire was organized in 6 different groups of questions gathered by area of interest (Personal Data, Get involved, Get Active, Elections and Participation, EU and Participation, Note). The English version of the report you will find HERE and by clicking ‘Open on-line research’ tab in the right-side menu. The report will be now translated into 4 national languages of the project Partners. The national translations will be available in December 2015. The project “Let’s get Active! 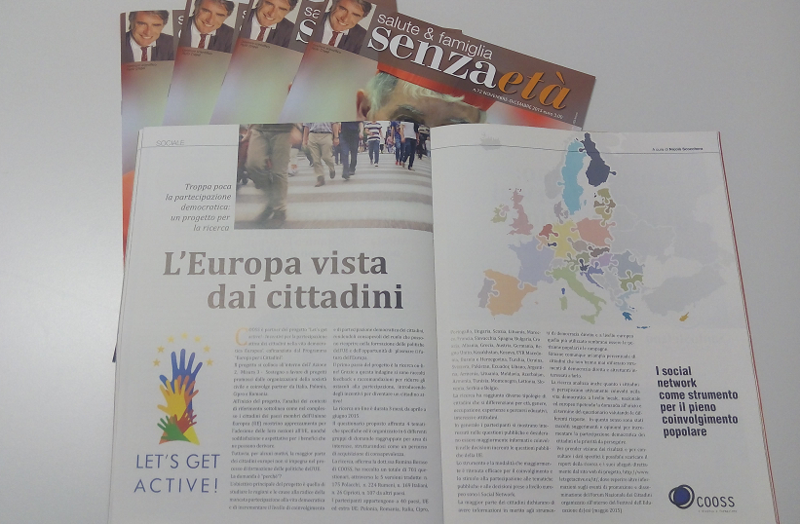 Incentives for citizens active participation in the democratic life of the European Union (ACTIVEU)” was presented in an article published in "Senzaetà", a magazine specialized in healthcare and wellness and distributed in 50,000 copies throughout Italy. The magazine proposes surveys, enquiries, interviews, news, under the scientific direction of Professor. Paolo Crepet, well-known psychiatrist and writer. A multimedia oriented information/communication network was created around this magazine, dedicated to health, wellness, family, quality of life issues. To watch the live trasmission of the International Citizen's forum click here on Thursday the 15th of October at 09:00am (CET). INVITATION - IDEA PRISM for LET'S GET ACTIVE! The on-line research is now closed. Thank you for sharing your opinions!